from 15 pcs. 0,77 EUR ea. from 40 pcs. 0,68 EUR ea. from 80 pcs. 0,63 EUR ea. Ask for a rebate from 700 pcs. Bestseller: More than 4 million sold! An extremely flat disc magnet with an adhesive force of 2 kg. 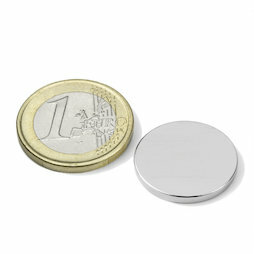 Affordable and discreet - one of our magnet bestsellers! Is perfectly suitable for closures of any kind. We also carry a self-adhesive version of this item: S-20-02-FOAM. 5 pcs. 1,02 EUR ea. 10 pcs. 0,93 EUR ea. 5 pcs. 1,08 EUR ea. 5 pcs. 1,32 EUR ea. 5 pcs. 1,50 EUR ea. 5 pcs. 1,47 EUR ea.